Edraw is used as a seating plan software coming with ready-made seating plan templates that make it easy for anyone to create beautiful seating plan. The seating plan templates are easy to use and free. Edraw can also convert all these templates into PowerPoint, PDF or Word templates. Creating a seating plan in Edraw is easy. It only takes a few minutes to create wall structure, add tables, and customize the room. If you want to use a ready made template, go to seating plan templates page and choose the Seating Plan that best suits you. 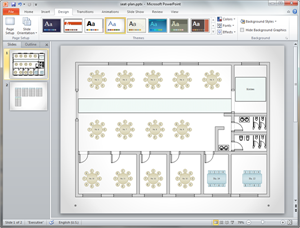 When you finish creating your seating plan in Edraw, one click on the Export button will transfer your drawing into MS PowerPoint presentation. You need to consider few things when creating a seating plan. To customize our template, you need to download Edraw software and use its powerful tools. All templates in the software gallery windows are easy to change color, theme and effect. Only clicking on the Export PDF button will convert your seating plan template into PDF. 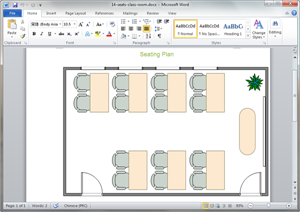 You can view the PDF Seating Plan Template to view the quality. If you are still looking for a seating plan drawing tool, here is your way out. 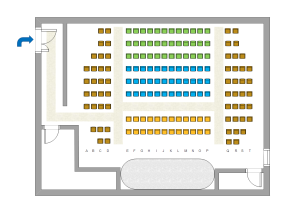 Edraw offers an easy solution in making all kinds of seating plans including theatre seating plan, class room seating plan, wedding seating plan, canteen seating plan, and much more. It provides plenty of vector symbols commonly used in seating plan construction, such as wall structure, windows and doors, tables and seats, every element with more than one style. Besides, built-in dimension tools ensure accurate measurements. 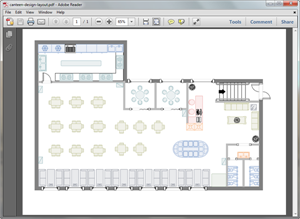 Whenever you're embarking on seating planning, Edraw will be your absolute choice.